The Newark City School District has received the Auditor of State Award with Distinction, based on the district’s accurate record keeping and clean financial reports. Only 5 percent of Ohio’s 6,000 public entities receive the award. 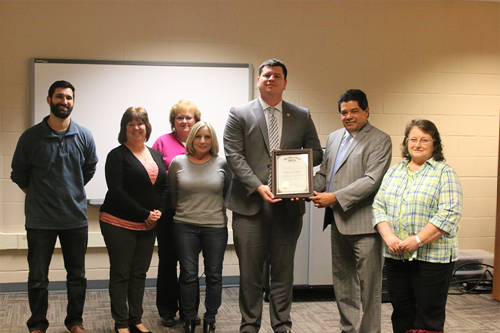 A representative from the Ohio Auditor’s Office presented the award to District Treasurer Julio Valladares during the April 2018 regular Board of Education meeting. The award is given to entities that file a Comprehensive Annual Financial Report and receive a “clean” audit. “This could not have happened without the hard work, day in and out, of the staff in the treasurer’s department,” Valladares said. The treasurer’s department staff includes Trent Montgomery, Kelly Hayes, Debbie Hill, Tammy Berry, Cheryl Hardbarger and Myra Brandenburg. Valladares also credited former treasurer Jeff Anderson, who passed away in spring 2017, and former assistant treasurer Patty Stocker, who retired in December, for the award. District financial reports can be found online by clicking on this link.